What kind of tank do you use when you go diving? The size of the tank and whether it's made out of steel vs. aluminum will hugely influence how much weight you'll need to take with you on your dive. Many divers think diving with one type of tank is better than diving with another. The truth is that the type of diving you do, where you are diving and even the thickness and type of exposure protection you use can play a part in your choice of SCUBA cylinder. In another post, we talked about the importance of buoyancy checks and determining exactly how much weight you need in order to make your body neutral underwater. Besides your body and your gear, you have to compensate for your SCUBA tank as you dive. What 2 metals are SCUBA tanks made of? There are two types of SCUBA tanks for divers to choose from. 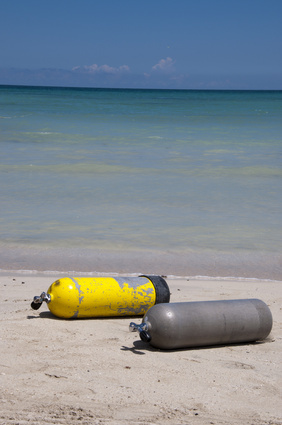 Aluminum SCUBA tanks tend to be negatively buoyant at the start of your dive when they are full. However, as you dive, these tanks tend to become neutral and can even be positively buoyant by the end of your dive. Because of this, you have to consider the tank’s positive buoyancy at the end of your dive when determining how much weight you will need. Both steel and aluminum SCUBA tank sizes vary. Different tank sizes have different buoyancy characteristics. For example, a steel 120 SCUBA tank will have different buoyancy characteristics than a steel 80 SCUBA tank. Not only do sizes affect their characteristics, whether it is a high pressure SCUBA tank or a low pressure SCUBA tank makes a difference and so does the tank manufacturer. Faber tanks specs are not the same as Catalina or Luxfer tanks. It is important to research these differences when choosing your tanks. Steel SCUBA tanks tend to be negatively buoyant throughout your dive. So when diving with steel tanks, you will not need the same amount of weight. It is important to keep in mind that the buoyancy characteristics of steel tanks also change throughout a dive. So while a steel tank might be very negative at the start of a dive, it can become closer to neutral as you dive. We did a quick video below to illustrate the point. It’s a cool little experiment you can try with different cylinders and see what the buoyancy characteristics are. What cylinder do you dive with and why? Please feel free to comment below, we would love to hear from you!